How can a war shape a country and its people? To what extent may social pressure affect the behaviour and political ideas of individuals? And most importantly, can a conflict change dramatically the way a child perceives the world around him? La lengua de las mariposas takes place shortly before the start of the Spanish Civil War, during Manuel Azaña’s liberal Second Republic (1931 – 1939). Director José Luis Cuerda portrays this period idyllically in the film– warm colours, soft music – adding at the same time a powerful sense of nostalgia to it. In a remote village in Northern Spain, young Moncho is about to start primary school. The local teacher, Don Gregorio (Fernán Gómez) is a wise and affable republican man who frequently takes his pupils out for walks in nature, trying to transmit his love of the arts and science to them. Life is good for Moncho and his humble family, as we become witnesses of their everyday lives and other villagers’. But this sense of peace and quiet is soon to be disrupted by the political events which are about to shake the country – General Franco’s troops are taking over and feelings of fear and insecurity will eventually upset the peace within the community. 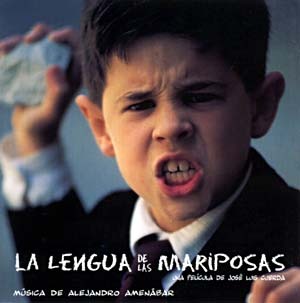 José Luis Cuerda’s La lengua de las mariposas is based on the short story collection “¿Qué me quieres, amor?” (‘Vermeer’s Milmaid and Other Stories’, 1995) by Galician writer Manuel Rivas, who also co-wrote the script with Rafael Azcona (Plácido, The Little Coach). The result is a clever adaptation of some of these short stories, divided in three or four secondary storylines which intertwine with the main plot quite effectively. The primary storyline shifts from the development and consolidation of Moncho’s friendship with Don Gregorio until their separation caused by the start of the war, reflected in one of the most heart-breaking scenes in Spanish cinema. Despite the tragic historical incidents that the film anticipates, La lengua de las mariposas is a truly beautiful work of art. The character of Don Gregorio (played by the unforgettable Fernán Gómez) is undoubtedly the most powerful element in this story, and will remain in the Spanish imagery for years to come as a representation of all the good things that were sadly lost during the war, and of the miserable times that would follow. Excellent review, I’m considering seeing this film now.